Saint Malo owes its name to a seventh century Welsh monk named Maclow. From the twelfth century onwards, the Malouins were to prove their anti-authoritarian nature and spirit of protest. 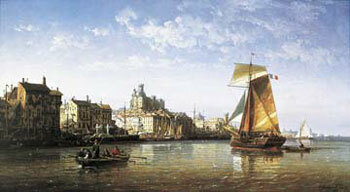 During the seventeenth and eighteenth centuries, Saint-Malo was phenomenally prosperous. The city's greatness and its world reputation as a port were forged by explorers of distant oceans and lands (Jacques Cartier, Mah? de la Bourdonnais...), shipowners, merchants and its famous and repeatedly victorious corsairs (Surcouf, Duguay-Trouin...). The heart of Saint Malo is the old walled town known as Intra-Muros (within the walls). St-Malo is a seaport, Ille-et-Vilaine d?partement, Brittany region, in northwestern France. It is situated on the English Channel and on the right bank of the estuary of the Rance River. The old walled city stands on a granite islet that is joined to the mainland by an ancient causeway and by an avenue bridging the inner harbour. From the open sea, St. Malo must have appeared to the Acadians as a mirage or a city afloat on the waters. As the ships approached the fortified ramparts, their predicament, as rugged and rocky as this granite island, was indeed not illusion, but hard and cold reality. What an irony that from this city where French explorers went forth to New France would return the majority of the victims of France's overseas misfortunes. To the altar of the ancient Cathedral where Jacques Cartier, Father of New France, once knelt and pledged to carry abroad France's glory and banners, returned these weary, displaced subjected to exchange nuptial vows. The first arrivals appeared to be inhabitants of Isle Royale and Isle St. Jean who disembarked from the Antelope and Duke William on November 1, 1758. Two weeks later, on November 17, 1758, the queen of Spain brought additional passengers. On December 22, 1758, the President of the Navy Board informed M. Guillot that he had received a list of 217 persons who had recently arrived at St. Malo and instructed that they be paid the 6 sols a day. On April 6, 1759, two english packet-boats arrived with 451 prisoners from Ile Royale [now Cape Breton]. One hundred and thirty-two of them were soldiers sent to Rochefort. On April 30, 1759, it would seem that an addition two hundred and eleven soldiers returned includingone hundred and sixty who were prisoners in England. By Apirl 30, 1759, 1,102 Acadians from Ile Royale and Ile St-Jean had disembarked at St. Malo. St. Malo and surrounding villages would be great havens for the Acadian refugees. Lauvriere reported that upon their arrival, they had settled in huts of some kind at St. Servan at the foot of the cliff at the Parc des Corbi?re. It seems that lists found in the Archives of the Marine show that 26 had died during the month of May 1759. Ille-et-Villaine C?tes-du-Nord Manche, Nord, etc. According to this, not many Acadians lived in St. Malo. Most are found in surrounding or other villages and towns. Since so many were living in the area of St. Malo, it is not wonder that others were eager to go there in search of their families and relatives from whom they had been separated. At this point, all Acadians were given assistance no matter where they had been residing. Another reason for the unrest of the Acadians was their quest to find work. Certainly well seasoned sailors most of their lives, the sea had become quite dangerous because of the war. In fact, Augustin Benoist, Alain Bourg, Fran?ois-Xavier Bourg, Charles Trahan and others fell victims to this. They set off to sea and were soon captured by the British, brought to England and had to bide their time until they were either freed or exchanged. It was like the exile would never end. Those who found work did so fishing, sailing and/or farming. All familiar to them when they lived in Acadie. For instance, Andr? Temple, seaman, worked on a small boat. Fran?ois Hardy, seaman, was seasonally employed on fishing boats at Dinard. Benjamin Pitre and Antoine Aucoin, ploughman, were working as farm hands at St. Suliac. On October 15, 1763, the President of the Navy Board wrote to M. Chaulaire commending him for refusing passports to the Acadians at Boulogne to move on to other communties. He suggested that they await implementation of a plan which would relocate them in the spring. In 1763, with the work of the Duke of Nivernois, the Acadians who had been prisoners in England since 1756 were transported to France. A total of 375 refugees arrived in St. Malo aboard the Ambition and Dorthee. They were allowed six sols per day for their subsistence. On May 28, 1766, eleven families consisting of 73 persons arrived in St. Malo from Boulogne on the Brigantine, Le Hazard. These families had resided in Boulogne since 1758. The Schooner, Le Cr?ole transported 12 families/38 persons to St. Malo from St. Pierre et Miquelon. March 16, 1768, most of the individuals returned on the same ship. Following the Peace Treaty of Paris 1763, endeavors were made to make these refugees self-sufficient. Of the seventy-eight families that went to Belle-Ile-en-Mer twenty-two were from St. Malo. Life at Belle-Ile was difficut and after repeated failures at growing crops, many of them returned to St. Malo. In 1772, the project to move them to Poitou. Of the 2,370 Acadians enumerated, 1,712 were living around St. Malo. When this colony failed in 1775, 1,369 Acadians went to Nantes in four conveys listed elsewhere on this site. In 1784, 81 Acadians from St. Malo asked to go to Louisiana. Of the seven ships that sailed for Louisiana in 1785, one left from the port of St. Malo and on August 12, 1785, "La Ville D'Archangel carried 309 passengers/53 families. Many Acadians did remain in the St. Malo area where some descendants can still be found.